Cyclic peptide scaffolds are key components of signal transduction pathways in both prokaryotic and eukaryotic organisms since they act as chemical messengers that activate or inhibit specific cognate receptors. In prokaryotic organisms these peptides are utilized in non-essential pathways, such as quorum sensing, that are responsible for virulence and pathogenicity. In the more evolved eukaryotic systems, cyclic peptide hormones play a key role in the regulation of the overall function of multicellular organisms, mainly through the endocrine system. 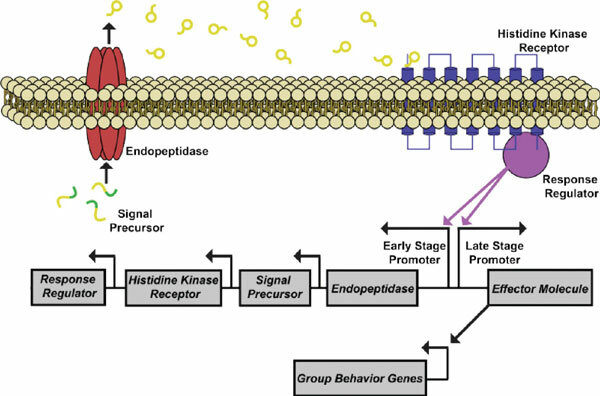 This review will highlight several prokaryote and eukaryote systems that use cyclic peptides as their primary signals and the potential associated with utilizing these scaffolds for the discovery of novel therapeutics for a wide range of diseases and illnesses. Keywords: Cyclic peptides, signal transduction, quorum sensing, prokaryotes, eukaryotes, hormones, autoinducers. Keywords:Cyclic peptides, signal transduction, quorum sensing, prokaryotes, eukaryotes, hormones, autoinducers. Abstract:Cyclic peptide scaffolds are key components of signal transduction pathways in both prokaryotic and eukaryotic organisms since they act as chemical messengers that activate or inhibit specific cognate receptors. In prokaryotic organisms these peptides are utilized in non-essential pathways, such as quorum sensing, that are responsible for virulence and pathogenicity. In the more evolved eukaryotic systems, cyclic peptide hormones play a key role in the regulation of the overall function of multicellular organisms, mainly through the endocrine system. This review will highlight several prokaryote and eukaryote systems that use cyclic peptides as their primary signals and the potential associated with utilizing these scaffolds for the discovery of novel therapeutics for a wide range of diseases and illnesses. Are the Pleiotropic Effects of Telmisartan Clinically Relevant? Is there a Role for Cortisol in the Accumulation of Lipids in the Intima a Crucial Step of Atherogenesis? MicroRNAs in C. elegans Aging: Molecular Insurance for Robustness?